FunVee Night Tour: Visit Gardens by the Bay, Boat Tour & Marina Bay Sands Upgrade! Enjoy some street shopping at the vibrant Bugis Village! Experience Singapore’s night time splendor as you drive around the city in a FunVee open-top bus. Enjoy 3 hours of sightseeing and explore major Singapore attractions such as Gardens by the Bay and enjoy retail therapy in the colourful Bugis Village after sunset. Drive past Merlion Park, Padang and the National Gallery, take pictures and enjoy a well-rounded introduction to this vibrant city! Watch the Supertrees come alive at night with a dazzling display of lights in the Garden Rhapsody in Gardens by the Bay and enjoy a boat tour on the Singapore River. Upgrade to admire Singapore’s iconic skyline and take in breathtaking 360-degree vistas from 600ft above the ground. 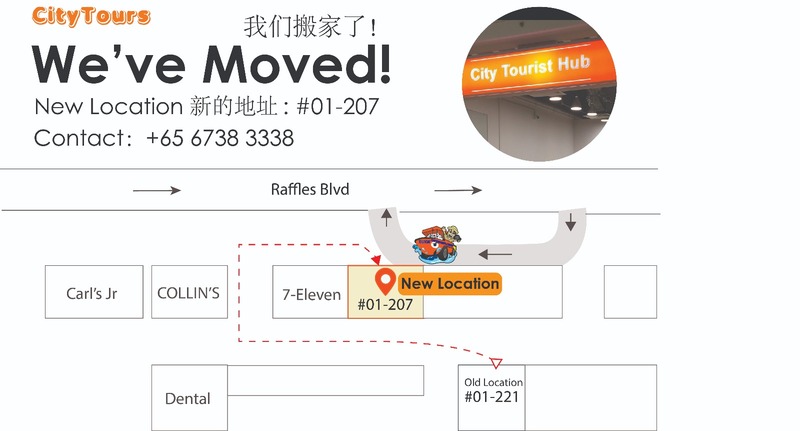 Make your way to Marina Square Shopping Mall, #01-207 - City Tourist Hub. Enjoy fabulous city sights atop the FunVee Open Top Double Decker Bus along with an experienced English speaking guide to take you through the journey. You will be visiting the Gardens by the Bay consisting of three distinctive waterfront gardens – Bay South, Bay East and Bay Central, spanning a total of 101 hectares. Watch the spectacular Garden Rhapsody and see the Supertrees come alive at night with a dazzling display of lights bursting across the sky. Drive past iconic places like Merlion Park, Padang and National Gallery and indulge in some street shopping in the vibrant Bugis Village, a row of multi-label stores, quirky boutiques as well as hip bars and cafes. Put your bargaining skills to test on any of the multiple shops and grab the best bet. A stroll along the Bugis Street never gets boring. You will receive “ Meal Voucher" which can be redeemed either at Toasties Sandwiches (Toasties @ Marina Square #03-212, 6 Raffles Boulevard, Singapore 039594, open 10:30am to 9:30pm) or Chinatown Food Street anytime of the day. The voucher is valid for 30 days from the date of the tour. Venues are subject to change. Lastly, proceed to Clarke Quay for a River Boat Tour along Singapore River. Clarke Quay is a riverside festival village dedicated to good times, combining dining and shopping. The quay is situated upstream from the mouth of the Singapore River and Boat Quay. Upgrade to marvel at the unsupported deck, the largest of its kind in the world and to enjoy panoramic views with nothing but a sheet of glass and a few wires between you and the view. Experience the beauty of Singapore from the large wooden decked area on top of the iconic Marina Bay Sands hotel at the edge of the city’s harbor and enjoy an unmissable Singapore experience. The Marina Bay Sands hotel Skypark has been one of the most popular attractions in Singapore since it opened at the turn of the decade. Chinatown Meal voucher is an open dated voucher and can be used any time of the day. It is valid for 30 days from the date of the tour. This itinerary may be changed during festive season. Photo Id of the ticket holder may be required upon entry.